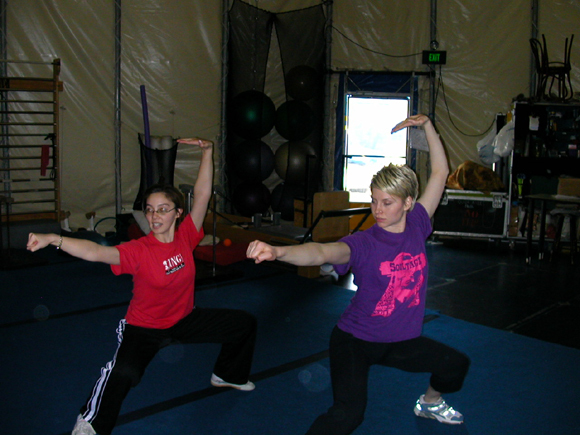 JING was honored to give a Wushu seminar to the cast and crew of Quidam, the touring Cirque du Soleil show, on Wednesday, September 15, 2006. We had a great time working with professional acrobats and theater technicians, and were pleased to learn that we gave everybody quite a workout! We came back later to watch the fabulous show and take a backstage tour, and Siu-Fong even took the acrobatic team to Balboa Park -- 4 little girls from China, their Coach Zhang, and their Guardian (not pictured)! 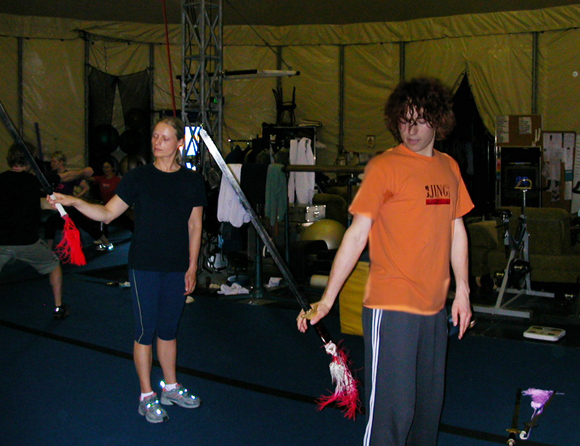 Wesley trying to teach Wushu Sword to a professional acrobat. A happy picture after a tiring seminar. After the show: Asa (hand-to-hand performer) and Hiro (jump rope! performer) with Chris. What make-up! 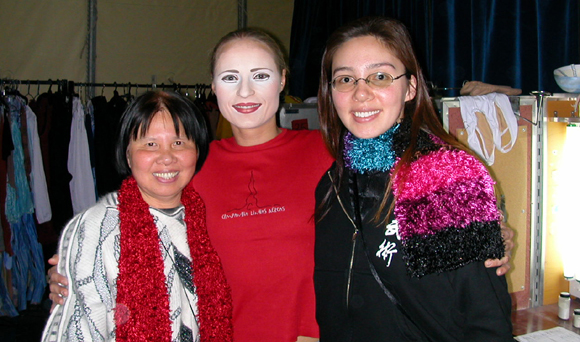 Siu-Fong and Jing Jing, backstage with Denise (rope aerialist). See the make-up cabinet on the right, and all the costumes behind us?! 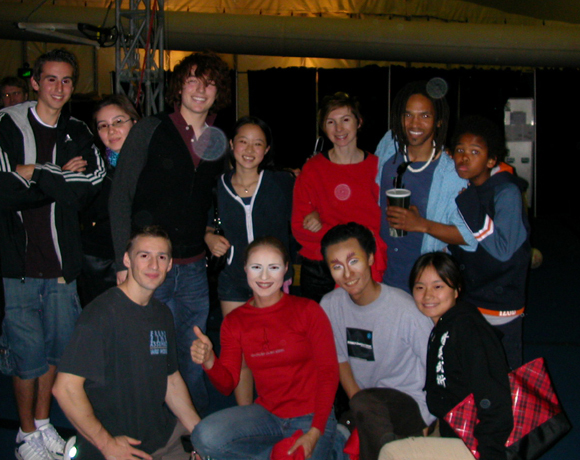 Some of JING, with some of Quidam, in the "Artistic Tent" after the show. Siu-Fong and Huang Qin with the Chinese Delegation (the 4 girls do Diablo). 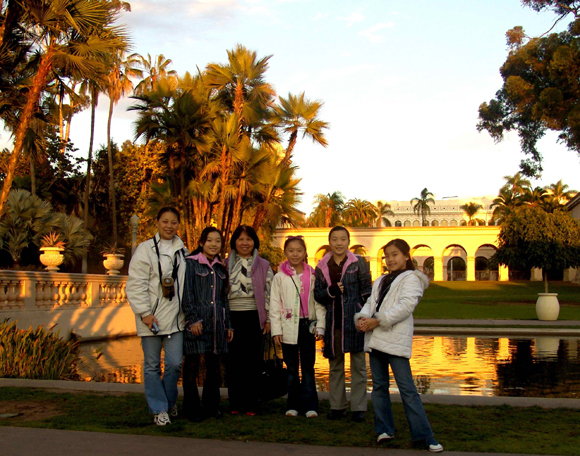 Mama and the Diablo Girls and their Coach at Balboa Park. The sun sets golden when you are out with Cirque e du Soleil!